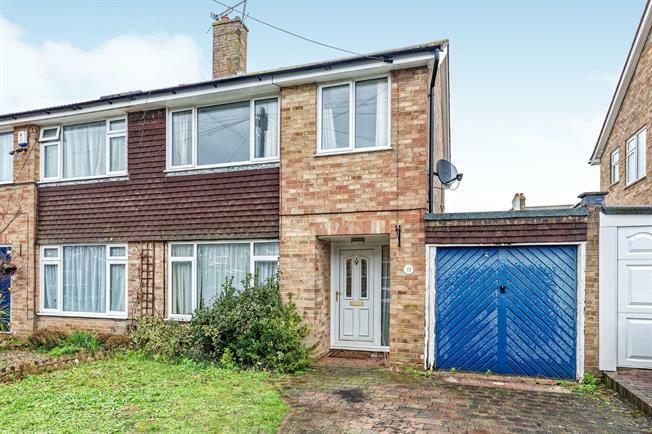 3 Bedroom Semi Detached House For Sale in Canterbury for Offers Over £300,000. An ideal extended three/four semi detached home with garden, garage and driveway. Accommodation comprises; entrance hallway through to spacious lounge to front, separate dining room/bedroom four, large fitted kitchen/breakfast room and entry into the garage. Rising to the first floor you will find three goods sized bedrooms and family bathroom. To the rear is a lovely garden with shed and mainly laid to lawn. To the front of the property is a driveway with parking for two cars. Offered with no chain. The property offers very versatile living accommodation and situated in the desirable area of Rough Common, making it an excellent home for those looking to be close to fantastic primary and secondary schools, good commuting links including both the A2 and Canterbury West station that benefits with a direct route to London St. Pancras. Rough Common is situated within close proximity of the city of Canterbury, being within easy access of the High Street and all its amenities. These include an excellent shopping centre, the University of Kent, Canterbury Christchurch College, together with an excellent choice of schools in both the public and private sectors. Rough common benefits from a local shop and numerous bus stops and access to the A2.